This big snake really is big, 60 metres big! A worthwhile spot especially if you’re in need of a rest room. 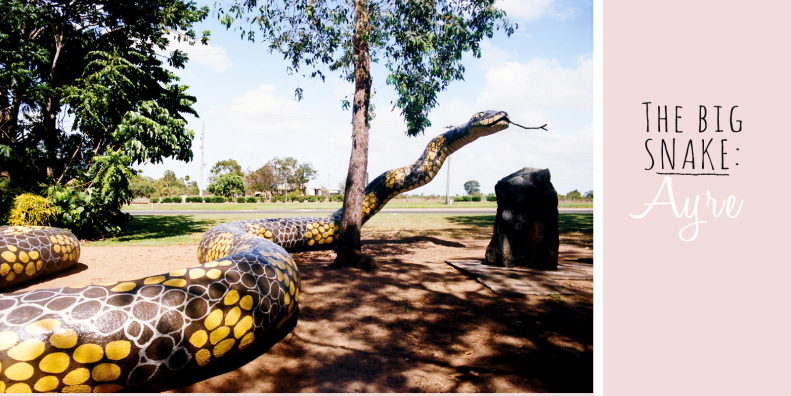 "Gubulla Munda (Carpet Snake) is the Aboriginal Totem and the protective Spirit for the Biri Gubba people. Its construction on this site is for the honouring of the sacred burial site where many Aboriginal ancestors are buried. This monument was designed, constructed and sculpted by the artist Dr Farvadin Daliri OAM and painted by many Aboriginal artists. The Dreaming comes from the high power of Younga Yalga (Mother Earth) Gubulla Munda who travelled through the waters up to the land and rested. The perspiration of Gubulla Munda formed hills and mountains, rivers and streams. Later she travelled back down into the water and as she moved through the water, her dropping formed the islands"
Address: Plantation Park, Bruce Hwy as you travel through the small town of Ayre, QLD.